India could do far better. That, in a sentence, is the conclusion of Vijay Joshi’s superb book. Joshi is an Indian economist who has spent most of his professional life at Oxford university. In this penetrating account of the past and present of Indian economic development, he casts a bright light on the prospects ahead. If India’s aim is to become a high-income country in the next generation, its economic, social and political performance needs to improve dramatically. The good news is that there is room for improvement on many fronts. The bad news is that the obstacles to the needed improvement are huge. Worse, many emanate from the failures of the state and the political processes that guide it. Yet, as Joshi also notes, “The two fixed points in the socio-political setting of the Indian state’s development policies are that the country is a democracy, and an extremely diverse society.” The challenge is to improve performance within the constraints of these realities. The success of Indian development matters, for at least three reasons: India will soon be the most populous country in the world; it is already far and away the largest democracy; and, above all, despite progress in the last three decades, between 270m and 360m Indians still lived in dire poverty (on slightly different definitions) in 2011 (that is, between 22 and 30 per cent of the population). If extreme poverty is to be eliminated from the world, it must be eliminated in India. While the focus of India’s Long Road is on the economy, its analysis is appropriately comprehensive. It considers the post-independence growth record, the failure to create remunerative employment, the excessive role of publicly owned enterprises, the poor quality of Indian infrastructure and the inadequacy of environmental regulation. The book also analyses the successes and failures of macroeconomic management, the appalling quality of government-provided education and healthcare, the need for a better safety net for the poor, the long-term decay of the state, the prevalence of corruption and the role of India in the world economy. In covering all these issues, Joshi combines enthusiastic engagement with the detachment of a scholar who has passed much of his life abroad. No better guide to India’s contemporary economy exists. Over the past 70 years, India’s growth has shown two marked accelerations. The first followed independence in 1947. The second followed the economic liberalisation that began in the 1980s and accelerated dramatically after the balance of payments crisis of 1991. In the first period, growth averaged 3.5 per cent a year. In the second, it rose to 6 per cent (4 per cent per head). Unfortunately, after a further acceleration in the first decade of the 2000s, growth has slowed once again. The principal explanation for this recent slowdown is a marked weakening of investment by an over-indebted private sector.Joshi argues that India could provide a basic income to all by diverting resources wasted on subsidies. So what should be the goal for the decades ahead? Joshi describes it simply as “rapid, inclusive, stable, and sustainable growth . . . within a political framework of liberal democracy”. More precisely, if incomes per head could grow at 7 per cent a year, India would achieve high-income status, at the level of Portugal, within a quarter of a century. Only three economies have achieved something close to this in the past: Taiwan, South Korea and China. It represents an enormous challenge that cannot be met with the current “partial reform model”. The basic flaw of that model, argues Joshi, “is a failure to put the role of the state, and the relation between the state, the market, and the private sector, on the right footing”. The state, in brief, does what it does not need to do and fails to do what it does need to do. It is no longer enough for the state merely to get out of the way, important though that still is in crucial areas. Among these is the labour market, whose huge distortions and inefficiencies have turned the demographic dividend into a demographic disaster. Thus, in the 10 years from 1999 to 2009, India’s workforce increased by 63m. “Of these, 44 million joined the unorganized sector, 22 million became informal workers in the organized sector, and the number of formal workers in the organized sector fell by 3 million.” This is a social catastrophe. It is due not only to labour-market distortions, but to a host of constraints on the creation, operation and, not least, closure of organised and large-scale businesses. Yet India also needs an effective state able to supply the public goods, public services and competent regulation on which an efficient economy depends. Unfortunately, that is not what now exists. All international surveys give India a very low rank for the efficiency and honesty of the state and the ease of doing business. Joshi argues that while the economy is more dynamic and the quality of policy has indeed improved since the 1980s, the quality of the state has deteriorated in many respects. Among the many failures is the waste of state resources on inefficient subsidies that, though often given in the name of the poor, actually go to the better off. Indeed, one of the most original and persuasive aspects of the book is the argument that it would in principle be possible to provide a basic income to all Indians sufficient to lift everybody out of extreme poverty merely by diverting resources wasted on grotesquely costly subsidies. Yet, to take just one example, state governments continue to bribe farmers with free power, at the expense of a reliable electricity supply. Will prime minister Narendra Modi be the new broom that sweeps all these cobwebs away? Alas no. His government’s performance is “mixed at best”. It has some achievements. But it has shown insufficient energy in tackling both the immediate problems of inadequate private investment, excessive debt and feeble banks, and the longer-term problems of dreadful education, lousy healthcare, weak infrastructure, corruption, regulatory incompetence, excessive interference and government waste. A great opportunity for radically improved performance is being missed. This is not bad just for the Indian economy. There is a real danger that if the economy fails to perform as needed and desired, the governing Bharatiya Janata party will find itself increasingly attracted to its “dark side” of communal and caste division. That way lies not just economic failure, but possibly the destabilisation of Indian democracy, one of the great political achievements of the post-second world war era.Those who care about the future of this remarkable country and indeed the future of democracy itself must hope that Modi gets this right. If they want to understand what he needs to do and why, they should first read this book. JOSÉ BATISTA SOBRINHO helped build Brasília. In 1957 his meat business supplied canteens that fed workers constructing Brazil’s modernist capital. Now his two youngest sons, Wesley and Joesley, are bringing the place down. As the bosses of the company their father founded, renamed JBS in his honour, they are at the centre of a scandal that may force a president out of office for the second time in a year. JBS is the world’s biggest beef exporter. Its revenues rose from 3.9bn reais ($1.8bn) in 2006 to 170bn reais last year, helped by China’s appetite and Brazil’s enthusiasm for national champions. From 2007 to 2015 the development bank, BNDES, injected into Batista enterprises more than 8bn reais in capital and loans. Most of it was to help JBS buy rivals, including American brands like Swift and Pilgrim’s Pride. J&F, the family’s holding company, has diversified into non-meat businesses, including Havaianas, which makes fashionable flip-flops. As JBS was buying up rivals, the Batistas were buying politicians. 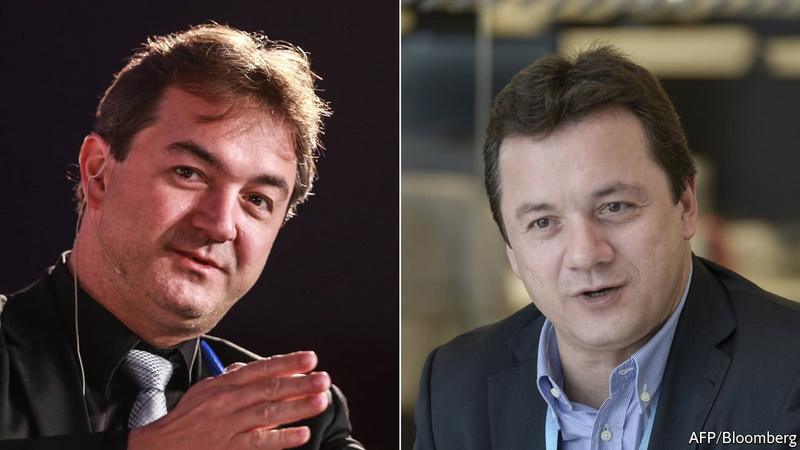 The company’s declared campaign donations swelled from 20m reais in 2006 to nearly 400m reais in the election in 2014; in that contest it gave more than any other firm. In the past decade the brothers have bankrolled 1,829 candidates; their largesse helped elect a third of the current congress. Little of it was legal. The Batistas have confessed that almost all the declared cash, plus millions paid under the table, was bribes to politicians specifically to further J&F’s interests. In the past year the Batistas’ firms have faced five criminal investigations. The latest probes J&F’s dealings with BNDES, which provided finance at the behest of paid-off politicians. To save their enterprises, and themselves, the brothers approached prosecutors investigating the metastasising bribery scandal centred on Petrobras, the state-run energy company. The bargain they struck was their niftiest deal yet. In exchange for providing evidence of wrongdoing by major political figures—including, possibly, President Michel Temer—they secured near-total immunity. Unlike Marcelo Odebrecht, boss of a construction firm at the heart of the Petrobras allegations, neither Batista will spend a day in jail or under house arrest. Free to leave Brazil, Joesley has already moved to his posh New York flat with his wife, a former television presenter, and their child. He and Wesley each agreed to pay fines of 110m reais, which leaves them both billionaires. The meat-mongers are not completely off the hook. JBS may face bribery probes and lawsuits from holders of the company’s securities in the United States. Brazil’s markets watchdog is looking into possible insider trading. In the weeks before May 17th, when details of their explosive testimonies leaked to the press, the Batistas sold more than 300m reais’ worth of JBS shares and bought dollars. The shares have lost a third of their value since then; the dollar jumped by 7% on the next day. The brothers and their firms deny allegations of insider trading. Apparently, they are blessed with their father’s foresight. If Jobs are Plentiful, How Come No One is Getting a Raise? U.S. unemployment is low, but it sure took a long time to get there. The economy added 138,000 jobs in May, the Labor Department reported Friday, and payrolls for March and April were also revised lower. That counted as mild disappointment. Still, the unemployment rate kept grinding lower, dropping to 4.3% from 4.4%, reaching its lowest level since May 2001. That counts as tight, and would normally be associated with rapidly rising wages as companies struggled to find workers. So far, it hasn’t. Average hourly earnings were up 2.5% from a year earlier, the lower end of the range it has been in for about a year. The weakness in wages has been a mystery. The standard explanation had been that a large number of people had stopped looking for work, so the supply of workers was greater than the unemployment rate indicated. This unseen supply was keeping wages lower. But those sidelined workers have been on the sidelines for so long that it is no longer clear they exist. The labor-force participation rate—the share of the working-age population working or looking for work—actually fell last month. It took a long seven years for the unemployment rate to get to 4.3% from the peak of 10% in October 2009. Because of the sluggish growth, businesses never had to scramble, and pay more, to add workers. And at no point did workers feel they were awash in opportunity. This slow growth doesn’t give people confidence to ask for higher wages. And plenty of workers have never experienced that kind of environment: The 2000s were a bit of a dud outside of housing. Only workers in their 40s and older remember the 1990s boom. Maybe the U.S. labor market is turning a bit like Japan’s, where the unemployment has fallen to its lowest level in nearly a quarter-century, but after so many years of disappointment, workers are hesitant to demand higher wages, and employers are hesitant to give them. The U.S. Navy has announced that the USS Nimitz will leave Bremerton, Washington, on June 1, for the Western Pacific. This is the third carrier battle group to be sent to the region – enough to support a broader military mission – and it will take roughly a week to get to its station, after which it will integrate with the fleet. So here’s the situation: Soon the United States will have its naval force in waters near North Korea. It already has strategic bombers in Guam, and it already has fighter aircraft in Japan and South Korea. The United States is preparing for war, which is still several weeks away – if indeed war actually breaks out. Between now and then, diplomacy will intensify. The international community will demand that North Korea abandon its nuclear program and allow inspectors to monitor the destruction of missiles, fissile material and reactors. And after Pyongyang refuses to heed those calls – which it probably will – the United States will have to decide whether it will strike. Importantly, the United States doesn’t want to strike North Korea. (It hasn’t even wanted to meddle in peninsular affairs all that much since the Korean War.) All wars are complicated – and only those who ignore the history of war would think otherwise – but striking North Korea would require a particularly long and complicated air campaign, not to mention some potential ground operations. And yet the United States is under pressure to strike. The pressure comes from the thought of a world in which North Korea has deliverable nuclear weapons. Pyongyang may not intend to use them or sell them right now, since its ultimate goal is survival, and having nuclear weapons deters attacks. But no one knows what North Korea will do in a decade or two. What North Korea does then may be determined by a person no one yet knows and whose behavior cannot be predicted. The U.S. government is thinking about what North Korean leaders intend to do later as much as it is thinking about what they might do now. Not knowing what it might do later is what really scares the U.S. North Korea has been willing to sell technologies to third parties in the past. Perhaps its program will be used only for deterrence for generations. But what’s to stop Pyongyang from selling technologies to third parties, even if North Korea itself never intends to launch an attack against the United States? The United States can try to detect such sales, but detecting all of them is very difficult; there are plenty of ways to deliver these weapons, and there are plenty of people who would be willing to buy them. The United States may be convinced, therefore, that the next few weeks will be its last opportunity to keep any of this from happening. More broadly, Washington may be convinced that this is a turning point for U.S. policy, shifting from a strategy in which it knows North Korea has no nuclear weapons to one in which it struggles to make sure North Korea doesn’t do something to hurt U.S. interests. However uncertain war can be, an unmolested North Korean nuclear program may be even more uncertain. Alternatively, the United States is also more likely to make economic concessions and political guarantees to North Korea than perhaps it once was. Either way, Washington can’t allow nuclear weapons to exist, and it can’t allow Pyongyang to determine what happens. But, ironically, it is to some degree up to Pyongyang to see what happens next. The North Koreans calculated that now was the moment to make the rush from an advanced program to deliverable weapons. Their reasons for doing so are unclear. Perhaps it is because of the turmoil in Washington. Perhaps they knew they would inevitably cross the red line and decided to go for broke. Whatever the reason, they are now in a position where they probably can’t capitulate even if they wanted to. Kim Jong Un has made the nuclear program the foundation of his – and therefore the government’s – legitimacy. The country has little else to offer other than this symbol of power. If he were to capitulate, Kim would appear weak, and that is something he simply cannot afford. If the goal of acquiring nuclear weapons is to inoculate the government against foreign threats, then abandoning the goal necessarily invites internal threats. Kim sits on top of a complex bureaucracy, which is terrified of him but also terrified of instability. Kim has to believe that even if the regime survives, he might be removed from power. And for all that is said about North Korea’s reclusion, Kim could not give in to the United States without his people knowing. Some news does filter into the North from South Korea, and even if the U.S. agreed to keep the capitulation secret, keeping political secrets in Washington is difficult, and never harder than today. Kim has only bad choices, but for a few reasons, the least bad choice for him is war. First, it’s possible that the U.S. is bluffing and that nothing will come from this episode. Second, it’s possible that China or Russia will intervene to save him, though neither country is up to the task of fighting a conventional war with the U.S. (Neither country is all that interested in saving the Kim government either.) It’s possible that South Korea, afraid for Seoul, will block the attack. It’s possible that Japan will get involved. It’s possible that the U.S. attack will fail. It’s possible that the nuclear program is further along than everyone thinks and that that will deter an attack. Barring this last scenario, it seems to me that the U.S. cannot refuse to go to war unless North Korea capitulates. North Korea cannot capitulate. Neither country wants to go to war, but neither can accept what is happening without war. My best guess is that North Korea currently does not have a weapon that could be readily delivered by stealth, and it would have to be demonstrated before an attack began, not after. I think we are looking at the prospect of a few weeks of quiet diplomacy and noisy public threats that will lead to war. The signs are all there. The United States does not deploy the force it has deployed unless it’s serious. Such was the case in Desert Storm, in Kosovo, and in the 2003 invasion of Iraq. By sending the USS Nimitz, the U.S. is telling North Korea, in no uncertain terms, that war is approaching. Now, it is North Korea’s move. Pyongyang had been quiet for a few days until firing a missile on May 28, which landed in the Sea of Japan. Still, you have to consider that North Korea is staring down into the abyss. NEW HAVEN – Ever since the “Great Recession” of 2007-2009, the world’s major central banks have kept short-term interest rates at near-zero levels. In the United States, even after the Federal Reserve’s recent increases, short-term rates remain below 1%, and long-term interest rates on major government bonds are similarly low. Moreover, major central banks have supported markets at a record level by buying up huge amounts of debt and holding it. Why is all this economic life support necessary, and why for so long? It would be an oversimplification to say that the Great Recession caused this. Long-term real (inflation-adjusted) interest rates did not really reach low levels during the 2007-2009 period. If one looks at a plot of the US ten-year Treasury yield over the last 35 years, one sees a fairly steady downward trend, with nothing particularly unusual about the Great Recession. The yield rate was 3.5% in 2009, at the end of the recession. Now it is just over 2%. Much the same is true of real interest rates. During the Great Recession, the ten-year Treasury Inflation-Protected Security yield reached almost 3% at one point, and was almost 2% at the recession’s end. Since then, the ten-year TIPS yield has mostly declined and stayed low, at 0.5% in May 2017. The fact that people are willing to tie up their money for ten years at such low rates suggests that there has been a long trend toward pessimism, reflected in the recent popularity of the term “secular stagnation” to describe a perpetually weak economy. After former US Treasury Secretary Lawrence Summers used the term in a November 2013 speech at the International Monetary Fund, the New York Times columnist Paul Krugman picked it up, and it went viral from there. Although secular stagnation became a meme five years after the 2008 financial crisis, the term itself is much older. It first appeared in Harvard University economist Alvin Hansen’s presidential address to the American Economic Association, in December 1938, and in his book published the same year. Hansen described the “essence of secular stagnation” as “sick recoveries which die in their infancy and depressions which feed on themselves and leave a hard and seemingly immovable core of unemployment.” When Hansen delivered his speech, he expected the US economy’s economic stagnation to persist indefinitely. The depression that had started with the stock-market crash of 1929 was approaching its tenth year, and World War II had not yet arrived. Only after the war began, in 1939, did the stagnation end. Hansen’s Great Depression-era theory of secular stagnation was based on an observation about the US birth rate, which was unusually low in the 1930s, after having already declined dramatically by the late 1920s. Fewer births perpetuated the stagnation, Hansen surmised, because people did not need to spend as much on children, and felt less need to invest in the future. Indeed, according to World Bank statistics, the global average birth rate has also fallen since the 2008 financial crisis. But low fertility had nothing to do with that crisis in particular, given that birth rates have been steadily declining for the better part of a century. Another explanation is that the 2008 crisis is lingering in our minds, in the form of heightened fear that rare but consequential “black swan” events could be imminent, despite moderately strong consumer-confidence measures and relatively low financial-market volatility (with some exceptions). A recent paper by New York University’s Julian Kozlowski, Laura Veldkamp, and Venky Venkateswaran argues that it is rational to harbor such fears, because once a formerly unthinkable event actually occurs, one is justified in not forgetting it. My own theory about today’s stagnation focuses on growing angst about rapid advances in technologies that could eventually replace many or most of our jobs, possibly fueling massive economic inequality. People might be increasingly reluctant to spend today because they have vague fears about their long-term employability – fears that may not be uppermost in their minds when they answer consumer-confidence surveys. If that is the case, they might increasingly need stimulus in the form of low interest rates to keep them spending. A perennial swirl of good news after a crisis might instill a sort of bland optimism, without actually eliminating the fear of another crisis in the future. Politicians and the media then feed this optimism with rosy narratives that the general public is in no position to sort through or confirm. Since around 2012, the equity and housing markets have been hitting new records. But the same sort of thing happened regularly in the Great Depression: the news media were constantly reporting record highs for one economic indicator or another. A Proquest “News and Newspapers” search for the 1930-1939 period finds 10,315 articles with the words “record high.” Most of these stories are about economic variables. In 1933, at the very bottom of the depression, record highs were reported for oil production; wheat, gold, and commodity-exchange-seat prices; cigarette consumption; postal deposits; sales or profits of individual companies; and so forth. Such rosy reports may give people some hope that things are improving overall, without allaying the fear that they could still suffer an economically catastrophic event. Barring exceptionally strong stimulus measures, this sense of foreboding will limit their spending. Narrative psychology has taught us that there is no contradiction: people can maintain parallel and conflicting narratives at the same time. When people are imagining disaster scenarios, policymakers must respond accordingly.